Hoo boy, I got busy and never posted for last Thursday’s Kitchen Cupboard, hosted by Robin. That’s where gardeners blog about what they used from their stored produce or made with their fresh produce. Here’s what I used last week. 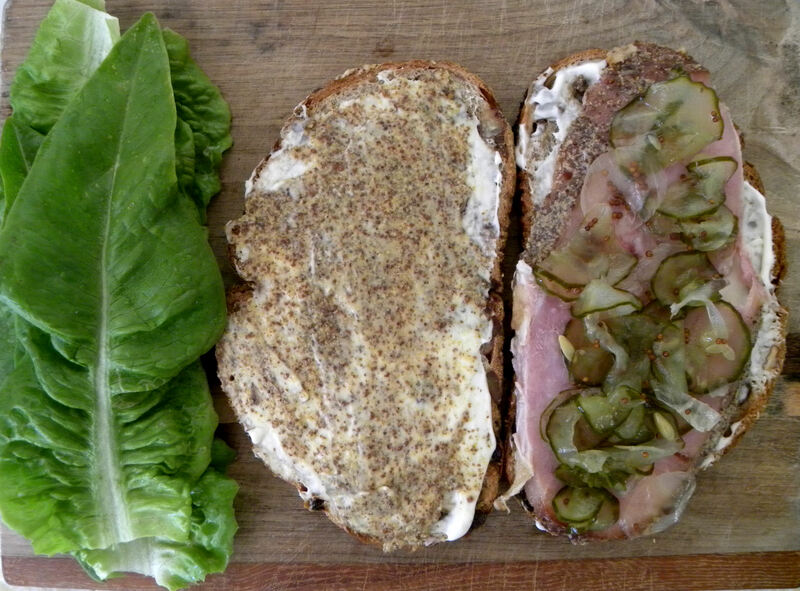 This is a ham sandwich on Russian Raisin Pecan bread from Schat’s Bakkery in Bishop, CA. The mustard is homemade (thanks, Robin, for the recipe), as are the bread and butter pickles from last summer’s cucumbers. Still have two jars left. The lettuce is freshly picked Deer Tongue lettuce from my garden. Deer Tongue, Black-seeded Simpson and Lollo Rosa are my three favorite letttuces. Oh, better add Red Oakleaf to that list just for the pretty shape and color. We also had eggs from our hens for breakfast, and some eggs went into a homemade banana nut bread. I didn’t photograph the rest of my harvest from last week, which was just two avocados. So I’m going to put in pics of the actual garden, which I prefer anyway. I like to see gardens growing. My harvests are generally so pathetically small, that I’d rather photograph the living plants anyway. Some of the tomato seedlings that I bought developed damping off, a fungus. 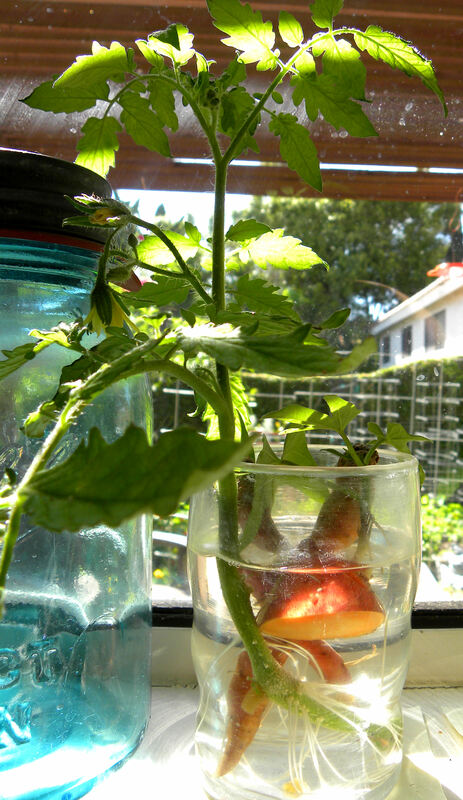 I cut the tops off above the infection and rooted the tomato tops in glasses of water on the windowsill. They're now ready to plant. I'm also rooting some yams. Note the blue Mason canning jar. That jar is from my Grandma Wilson, and about 80 years old by now. 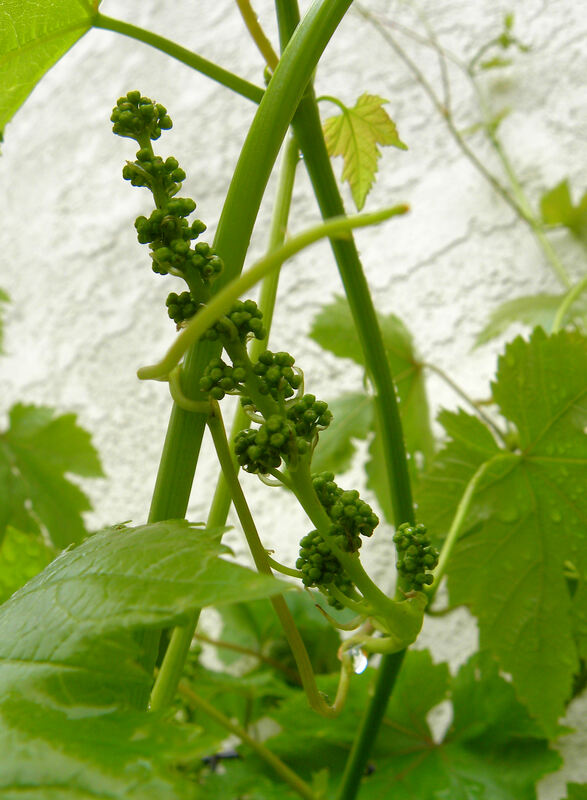 I'm still excited about my Red Flame grapes making their first flowers this year. I have no idea if these are flower buds or grapes. I'm just watching them grow in fascination, looking forward to my first home-grown grapes. 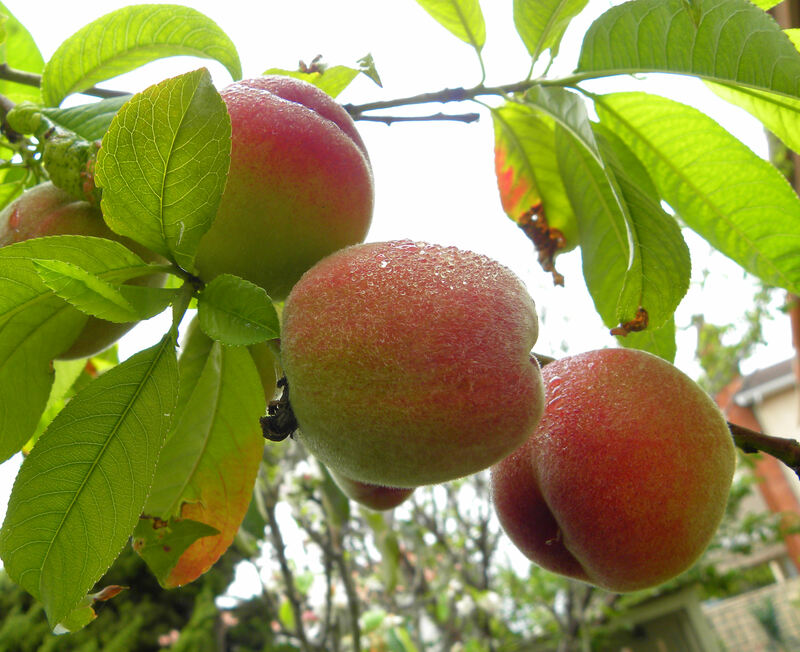 The Florida Prince peaches are nearing harvest. But I didn't thin them enough and the fruits are pathetically small again this year. This picture makes them look big, but they're not. I'm thinking that they're going to be mainly skin and seed. Time will tell. They should be ready to pick in another few weeks. 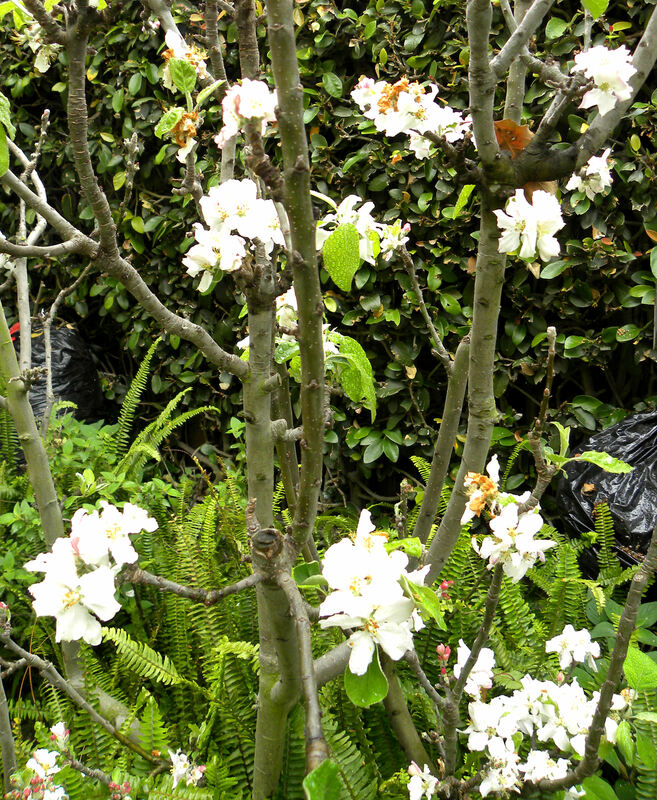 Our dwarf Granny Smith apple tree has more blooms on it this year than ever. Our normal crop is 30 full-sized apples. We'll see what the 2012 fruit set is in another month or so. Couldn't resist posting this pic of a rose. We had a really heavy fog this morning and everything was covered with dense dew. It was gorgeous out there. This is the view of our backyard looking south. Herb garden is in the foreground, then the chicken coop and the roses, irises, grapes, apple trees, the plum tree, and the Florida Prince peach. The rest of our backyard is occupied by more fruit trees and three raised beds for vegetables. This is bed #1. 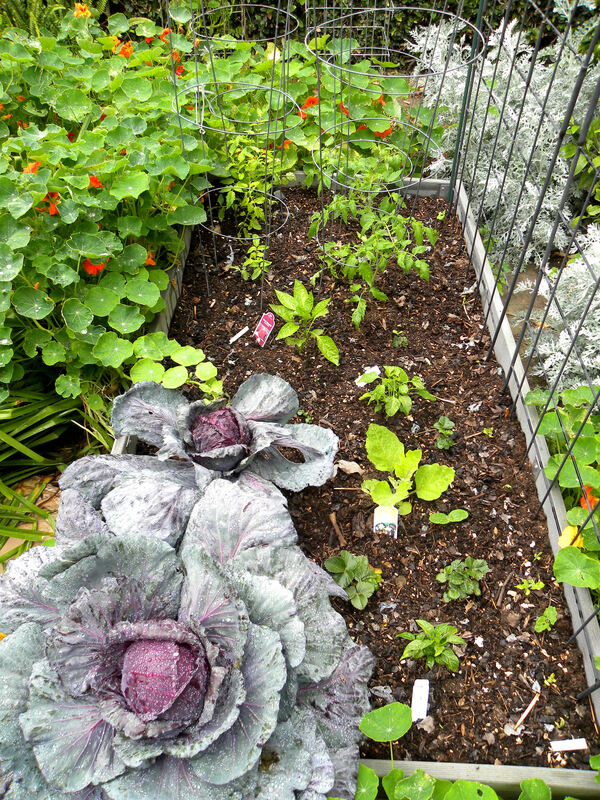 It has a few tomatoes, some Brussels sprouts that aren't making sprouts, some Lacinato kale that is at the end of its useful life in my garden, and a giant beet that I'm growing for the "Largest Beet" competition at the 2012 Orange County Fair. I grow mint and thyme outside this bed. Bed 2 has tomatoes, leeks, Deer Tongue lettuce that is going to seed (it's an heirloom variety and I'll save the seeds), a Black Beauty eggplant that I planted back in 2010 that is still growing, and a row of Super Sugar Snap peas that has just sprouted along the right side of the bed. They'll grow up the metal trellis from Gardener's Supply Company, source of my beautiful raised bed frames. 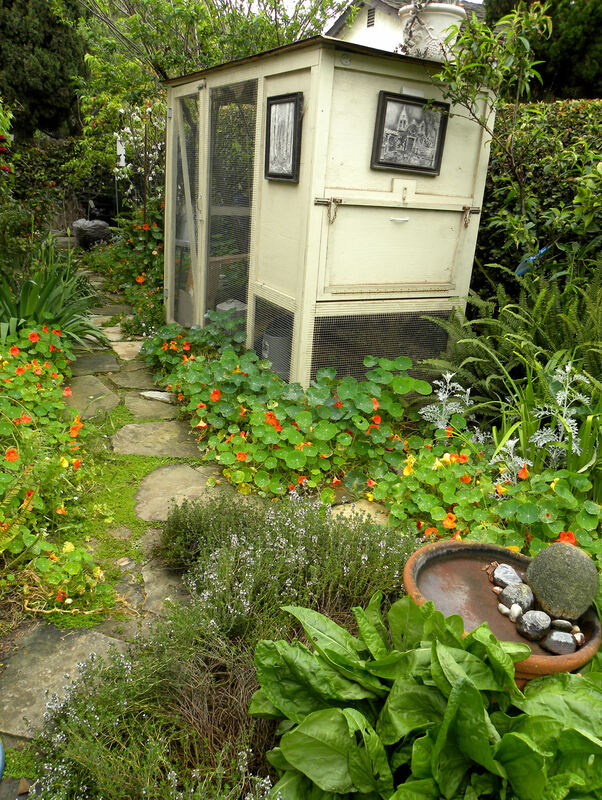 Nasturtiums and narcissus are growing around the perimeter of the beds. I can hardly get through the tangle of foliage to walk around the beds, but I love the look. We have no lawn at all. Saves water. Bed 3 with more tomatoes, a row of Blue Lake pole beans that just sprouted, strawberries, some bell pepper plants, a Black Beauty eggplant, and a couple of red cabbages that seem to be making heads. I haven't had a lot of luck with cabbage, so I'm looking forward to actually being able to eat a homegrown cabbage at long last. I grow peas and beans up a metal pea fence by the deck. 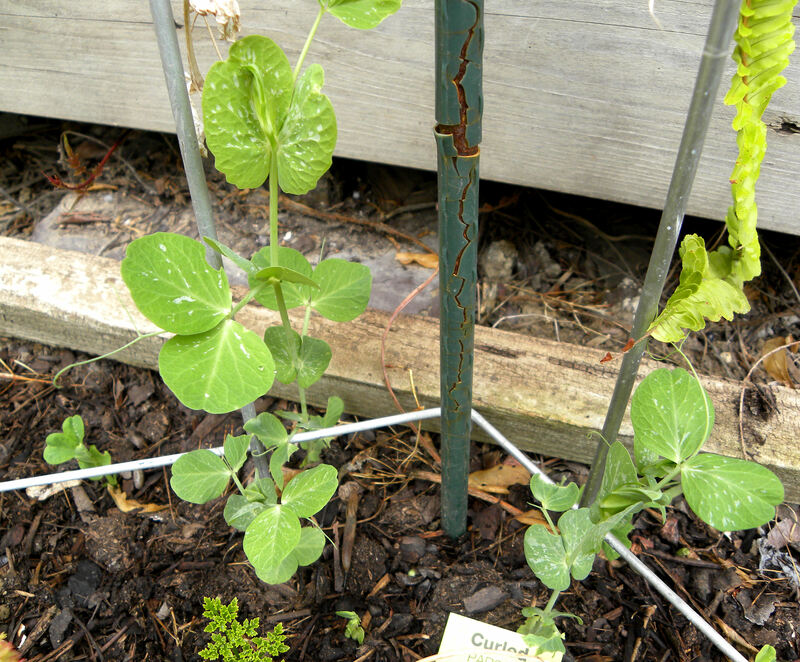 These are Mammoth Snow Peas, the second crop of the year to grow up the fence. When they're done, I'll plant pole beans. I didn't plant this. It sprouted from my homemade compost. I figure it's a pumpkin or winter squash of some kind. I know that I should weed it out, but I just can't. I figure if it came from my compost pile, it must be something that I grew. But I had some mini winter squash that were hybrids, so it could be anything. Hybrids don't breed true. I'm afraid that my curiosity about what it might grow into may overrule my better judgement (OK, THEM. There are 8 of them sprouted.) Time will tell. What do you say, weed it out or transplant it and see what it grows into? 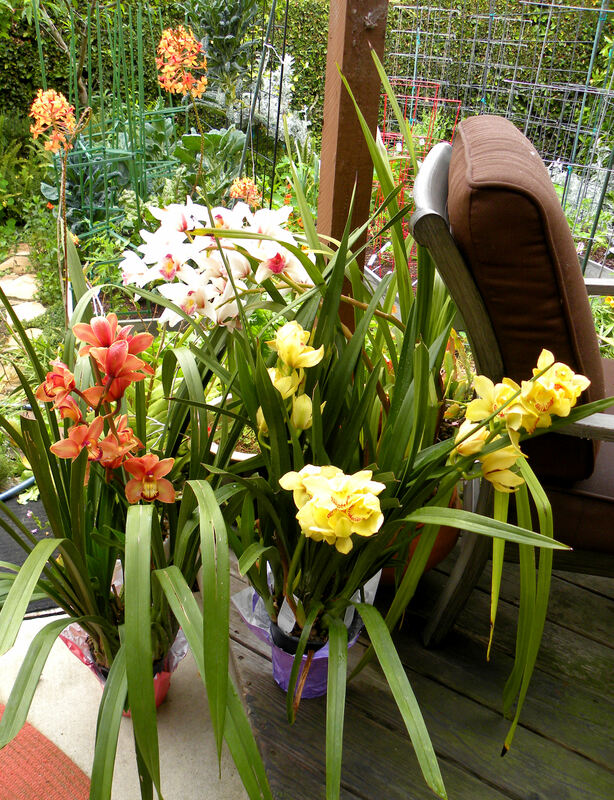 I bought some new orchids this year for the deck. Yep, they grow year-round outdoors in coastal southern California. I really like the three of them massed together. That’s it for the backyard. Now let’s move on to the less glamorous front. Our front yards are the showplaces of our properties, right? Sadly, not at our house. I have a vegetable garden right next to the sidewalk, and it never does very well. Consequently, or perhaps because, I neglect it. I call this my Garden of Infinite Neglect. It is so sad looking. I have plans to put in a raised bed here and see if that will improve growing conditions. It's going to rain here on Wednesday, so I am hoping to get that project done in the next two days. Or maybe I'll neglect to get "a round tuit." I grow potatoes and yams in Gro-pots in our driveway. Here is a pot of potatoes that volunteered from little potatoes that didn't get harvested. I won't know if they're German butterballs or blue potatoes until harvest time. They could even be Russets. 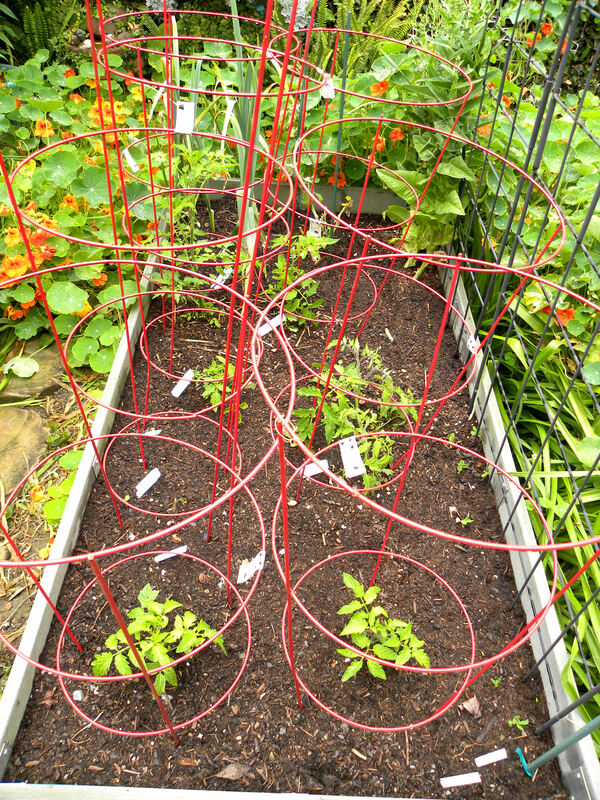 I've grown them all in these fabric grow-pots. I just add more fertilizer and reuse the potting soil and pots. 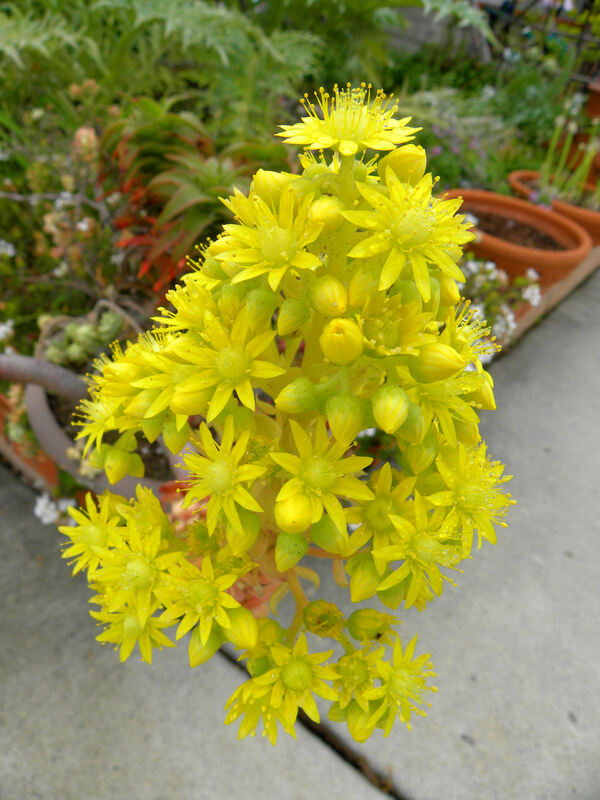 A pot of succulents in front of the Garden of Perpetual Responsibility has flowered. Nice flower. I see artichokes on the menu for dinner tonight. They were almost ready to harvest on Friday when we left for the weekend, but I didn't want them to just sit in the refrigerator. This one is a bit past prime. But it will go great with some chicken or steak cooked on the BBQ. 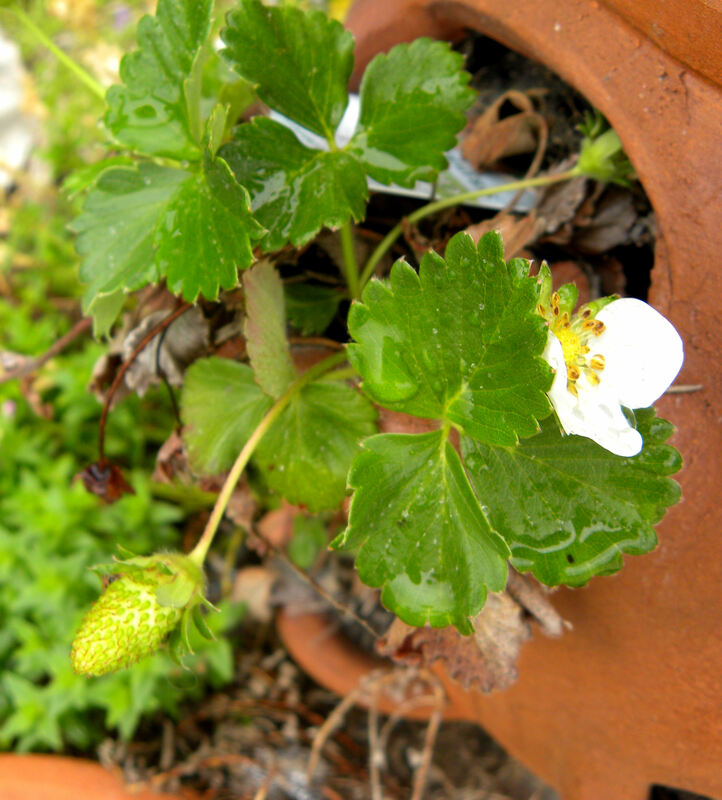 My strawberry pot got a bit neglected last year, but the strawberry plants survived. I fertilized and watered them, and am hoping for at least a small crop of berries this year. Our Fuyu persimmon tree has a half dozen flowers on it. It didn't produce any fruit last year. It might this year, but I STILL don't have it planted. It's in its original nursery pot. I think it would do a lot better if I actually put it into the ground. It's going into the Garden of Perpetual Responsibility, which is always loaded with weeds. I got some free irises from someone a couple of years ago. They are supposed to be white with ruffled edges. This one is neither. But I like it anyway. This is the first year of bloom for it. 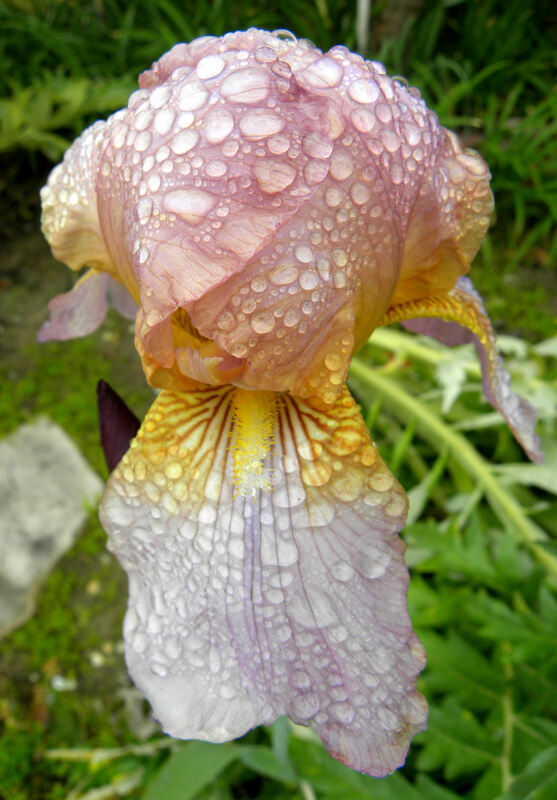 The other irises from that source are still small and haven't bloomed yet. Maybe they're the white ruffled ones. And that is the state of my home garden on April 23. I’ll blog about my community garden plot some other time. On to my itty bitty Harvest Monday. If you had a harvest, or you just want to see what others are harvesting, visit Daphne’s Dandelions. 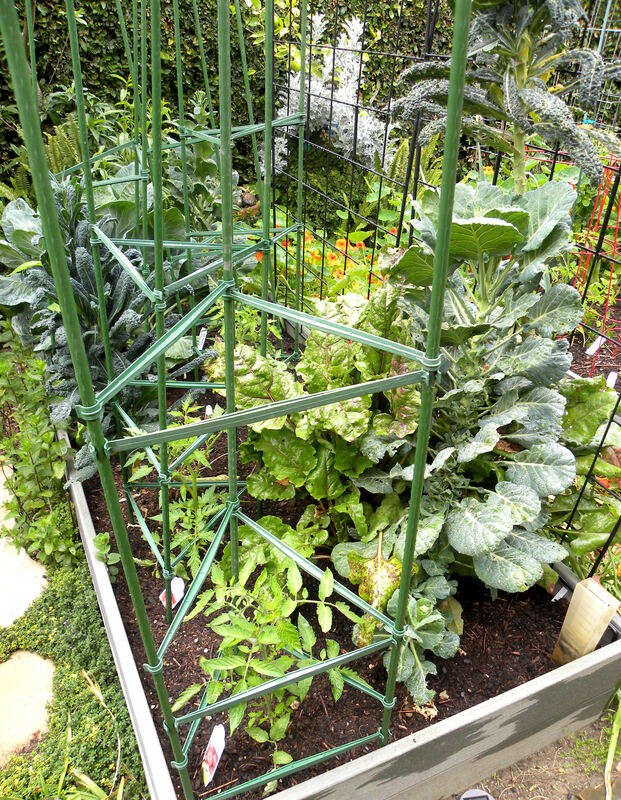 This entry was posted in Uncategorized and tagged artichokes, chicken coop, deer tongue lettuce, fruit trees, Gardener's Supply Company, Harvest Monday, Kitchen Cupboard Thursday, lettuce, peas, raised beds, sugar snap peas, tomatoes, urban chickens, vegetable garden. Bookmark the permalink. 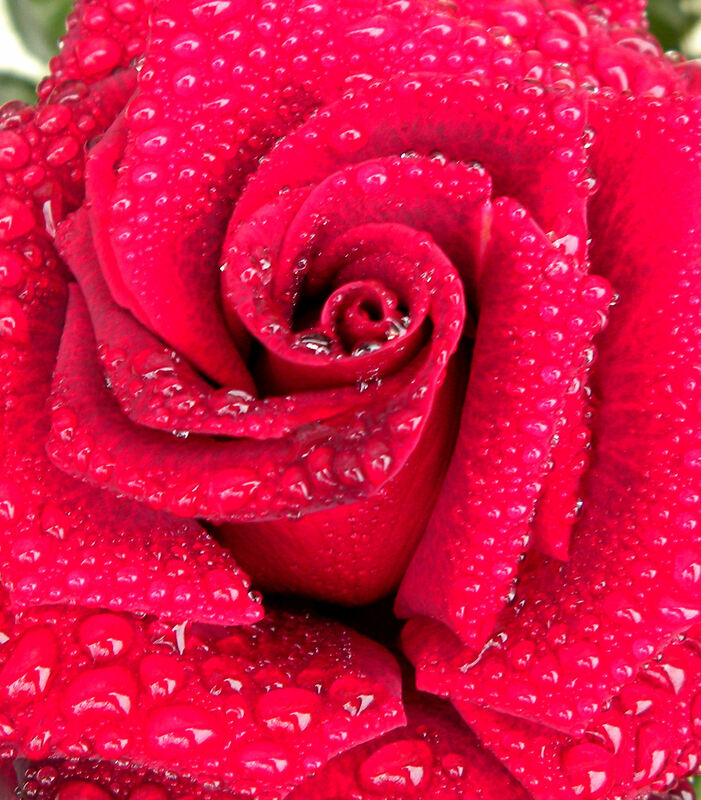 Love the rose with the dew, favorite pic. This is the first time I am seeing a fuyu persimmons flower, are there separate male and female flowers? You have a lot going on in your garden. 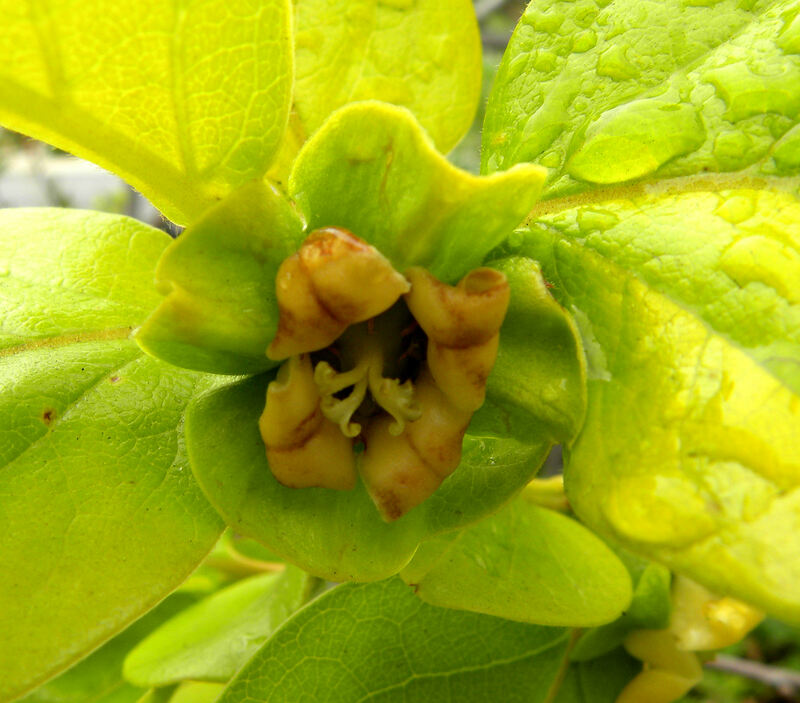 Norma, the flowers of the Fuji persimmon are complete, male and female in the same flower. I have a half dozen flowers this year, more than the one flower last year that didn’t get pollinated and fell off. I really need to go out and pick some lettuce. I love deertongue too. It is such a delicious lettuce. Daphne, I wish I had more deertongue to pick right now. It has gone bitter. I have some Grandpa Admire lettuce that sprouted, but I had no germination of my other varieties. Need to resow. The back definitely makes up for the Garden of Infinite Neglect. Inspirational it is. Thanks, Turling. As for the Garden of Infinite Neglect, I’ll get a Round Tuit one of these days. Your garden is beautiful! Perhaps that front yard would do better under a deep mulch with perienials? I vote leave the volunteers and see what you get! I love getting volunteers from the compost; this year I have what seem to be several apple seedlings! 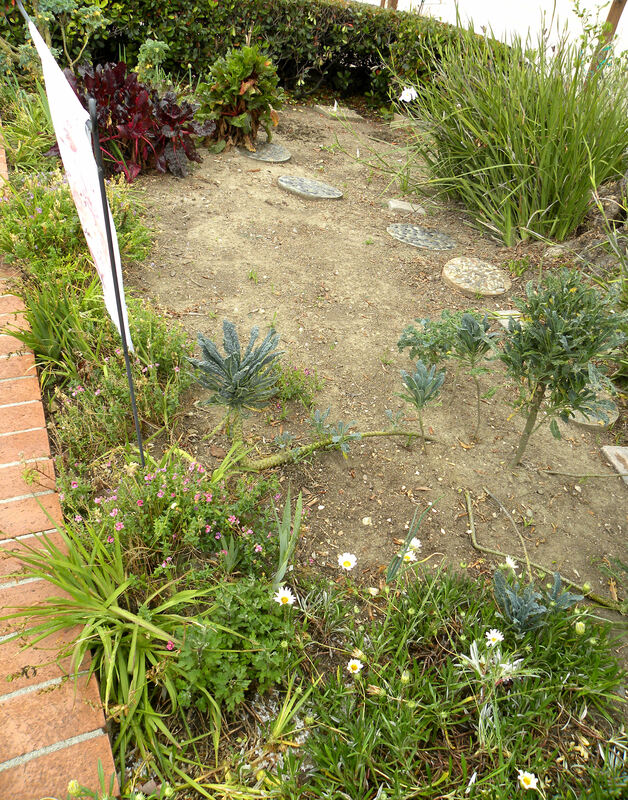 Mary, the front had been in drought-tolerant perennials. Looked fine, no need to care for them. But it ripped it all out to grow vegetables. Now if only they would GROW. I need to spend more time on that plot before giving up on it and putting it back into perennials. Everything looks beautiful and incredibly promising! And that sandwich of yours…holy cow does that look great! Bee Girl, it was so good that I made them two days in a row for lunch. Keep the squash! Looking forward to hearing about what it grows up to be! I have what appears to be a whole bunch of volunteer Japanese kabocha (and several tomatoes) growing out of my homemade compost I put down last fall, and one of them is in a particularly inopportune spot. I know I have to take it out or face very annoying consequences if I don’t, but it’s already starting to set fruit and I hate to do it 😦 I just LOVE nasturtiums for dressing up the garden. I got a spectacular display of volunteers this year. Brenda, the vote is to save the pumpkins. Or whatever they are. Some kind of winter squash. I’ll probably transplant a few of them out of curiosity, but they can’t stay where they are or they’ll get stepped on in my tiny garden. So happy to hear that you like the mustard! Boy your garden is in full swing! 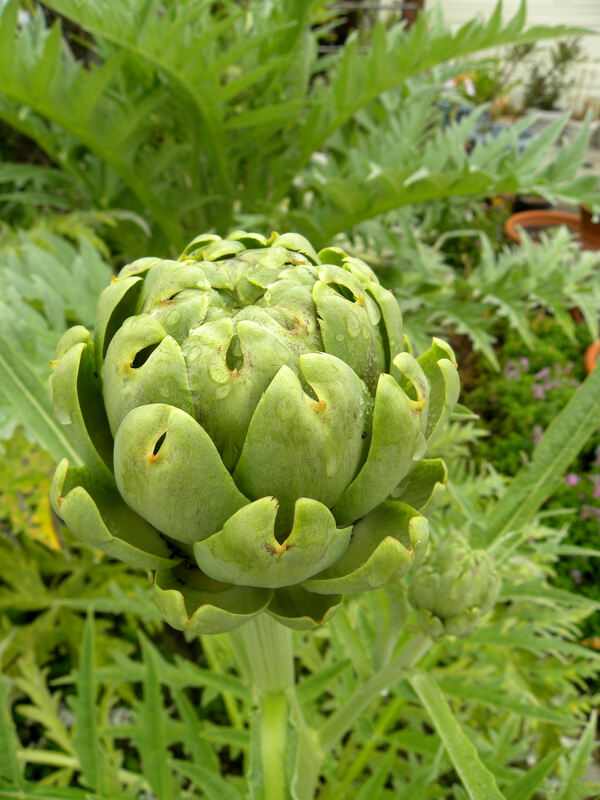 I’m a bit jealous of your artichokes. I have never had any success with them here. I am planning to try growing them again next year. 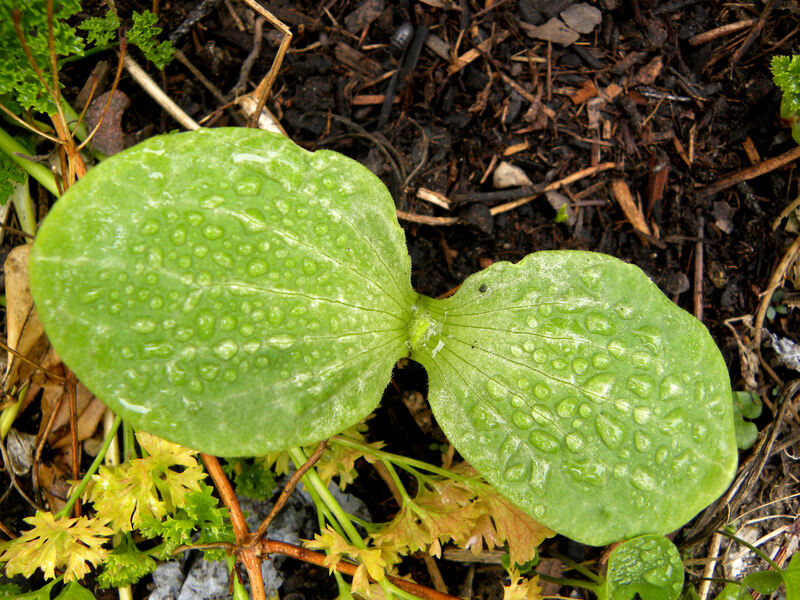 I had a squash grow out of my compost bin one year. That baby was the “Little Shop of Horrors Vine”! It grew several feet a day in several directions. Unfortunately it must have come from a hybrid squash that was given to me. But it was fun watching it grow! Oh, Robin, I don’t want a Little Shop of Horrors vine. I don’t have the room. I’m going to have to make a decision on them soon however. Good luck with artichokes. Here in coastal southern California they do very well. Yet again, you have soooo much going on in your lovely garden. I love that you managed to salvage the tomato seedlings! I just spent the day yesterday grafting tomatoes, and they need so much humidity during grafting I’m quite afraid they’ll develop fungus before they heal. The roots look great in that glass of water though, and as it takes so long for them to grow even to transplant stage, that saved a lot of time over having to sow seed again! Clare, you amaze me. You graft your own tomatoes? 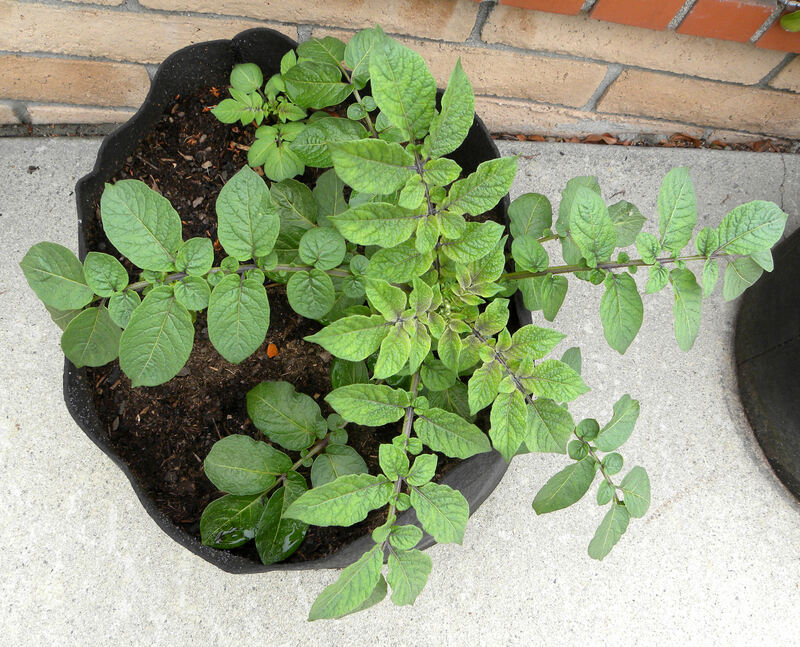 That is apparently the hot thing in tomato seedlings these days, but at $15 a plant, I have passed on those. Doing your own would save money. But why graft tomatoes? To get disease resistant rootstock and heirloom tomatoes? Such a wonderful variety of plants, your beautiful photos made me want to get outside right now and get busy! I’m glad. Thanks for stopping by, createityourself. Brenda, dwarf fruit trees are the way to go here in southern California. We have such tiny yards. I definitely envy the space that New England, Midwest, etc. gardeners enjoy. But we have a lock on good weather.